The fifth and final week of a long month has arrived. September is knocking on our doors, people! How are you going to answer? What will you be doing this weekend? Will you be birding? Share your plans in the comments below! I’m gearing up for another cool, wet weekend at the Finger Lakes. Can you sense my excitement over the prospect of 70-degree water? Corey will most likely spend a day at Jamaica Bay, and maybe a bit of time in Forest park hoping for migrant warblers. Charlie will be walking the manor grounds in search of proper British birds and butterflies. 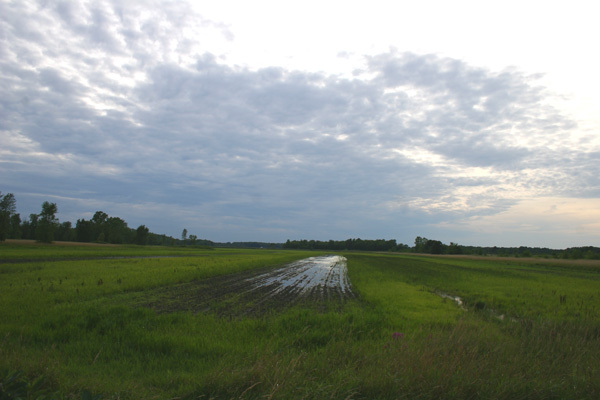 Believe it or not, Corey spotted shorebirds in this muddy Michigan field. I don’t see anything. Nice sky, though. It’s shorebirds or bust this weekend. There are very few places in my immediate area where they can be found, but I’m going to one of them. Mud be damned! Hoping TS Danny gets close enough to Long Island (But not too close)! Otherwise I’ll be trying to find something of value upstate. So, Will, you’re coming down Sunday then? Great depth in the picture! It is a nice sky! I like the reflection in the little bit of water in the field. I feel like I can see forever in this photo. I don’t see birds, but I agree, that is a pretty sky. An airport? Love the way you put some dept in it, realy nice, well composed!! We of ten get Ibis and ducks on our paddocks in the winter when the firlds are sopping wert. Pity you did not see the birds. I ‘ll be birding the country roads of the Ottawa Valley, along the Ottawa River, looking for shorebirds for “shore” Also starting to see lots of small flocks of thises and thats…a flock of flickers this morning! I agree, nice sky. It looks a bit like the end of that road. I think I’ll be in my kayak looking for shorebirds and waders in the salt marshes of Florida’s big bend area.